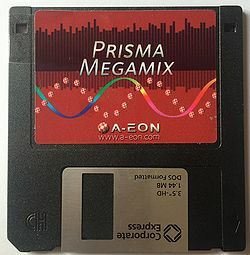 The Prisma Megamix is a music card for the Amiga computer. It is dual interface, being both Zorro II and clockport so it can be installed in a big box Amiga with Zorro II/III slots or installed in an A1200 Tower with a clockport cable. Compatible with Amiga A1200 T, A2000, A3000, A4000, A4000T. Before installation, it is important to observe anti-static precautions. Prisma is a [sensitive device] that can be damaged by static charge. Always wear an anti-static wrist band that is correctly earthed prior and during handling of the Prisma board. Ensure the Amiga is powered down. Remove the computer casing to reveal the Zorro slots, carefully noting cable orientations and safely store case screws for reassembly later on. Identify an empty Zorro II/III slot. Ensure the contacts on the slots are clean and free of corrosion. If not, we recommend using a small anti-static brush with isopropyl alcohol (IPA) solution to clean the contacts. Connect the 16-way ribbon cable into the black socket on the Prisma board (it is keyed so it will only connect one way). Connect the other end to the Prisma audio back plate. 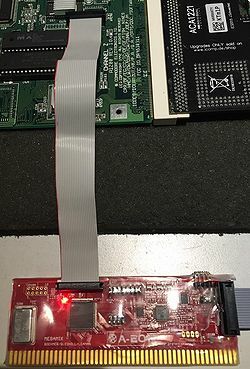 Installation into an Amiga 1200 desktop is possible by connecting to the A1200's clockport. It is very important to note that before installation, the Prisma must be fully electrically insulated to prevent damage of shorting against either the A1200 metal underside of the keyboard, floppy drive or upper RF shielding. The A1200's clockport header is located directly above the Kickstart ROMs on the A1200 motherboard. If you have the metal upper RF shielding still covering your motherboard, there is a small section that can be removed to reveal the header (secured by two metal lugs). Although the Clockport comprises of 22-pin header, you will notice that there are actually 44 solder connections on the A1200 motherboard with the first 22 connections on the left not being populated with any pins. Therefore the clockport cable must only be connected to the rightmost 22-pin clockport header. 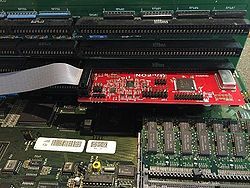 If have a rare A1200 motherboard which has all 44-pins populated or the leftmost 22-pins only soldered, then it has to be modified to use clockport devices such as Prisma. The red key wire on the clockport cable must be on the left hand side of the header as shown the picture below. It is very important not to displace cable plug onto the wrong A1200 clockport pins when installing it. Ensure you have good light and visibility to double check it is correctly plugged over the pin header. On the Prisma's PCB, there is a white square printed next to the clockport header which matches where the red key wire of the clockport cable plugs onto the board. Once again ensure that you do displace the cable plug onto the wrong clockport header pins when connecting it up to the Prisma. The driver software is supplied on Amiga formatted floppy disk with the card. Boot to your Workbench from your hard disk. Insert the floppy disk into the disk drive and the icon will appear on Workbench screen. Double click the icon to open the contents of the floppy disk and double click the Install_Prisma_Megamix icon. You will need the Installer utility loaded on your system to run the automated installation process. PrismaPlay is a CLI command that is supplied with the Prisma software distribution. To play supported music files, use the PrismaPlay command through the CLI. It will automatically open a file requester if you do not specify a filename in the CLI, so that you can easily navigate to the music file you wish to play. Please read PrismaPlay.guide (included in the software distribution) for a description of the options and the keyboard controls. The audio backplate is either a PCI/Zorro for "big box" Amiga's or the A1200 backplate which is installed in the small trapdoor slot underneath the floppy drive (next to the mouse/joystick ports). Both backplates have four audio connections. From the left the first two ports are for audio out and the rightmost two are audio in ports. With an optional stereo to phono Y cable, the audio in port can be connected to the Amiga's RCA stereo phono audio out to pass-through the Amiga's original Paula audio into the Prisma. A speaker cable should be connected to the left most port of the audio backplate. This page was last modified on 14 December 2016, at 21:10. This page has been accessed 84,647 times.